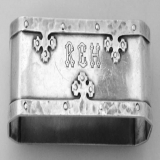 English sterling silver napkin ring by William Adams with the full set of English hallmarks for Birmingham c. 1910. This elegant napkin has a classic French look with its ribbon and thread applied border and a laurel leaf wreath blank reserve surrounded by repousse floral decorations. Dimensions: 1 7/8" X 1 5/8", weighs 33 grams or 1.1 ozs Troy. The excellent original condition and clear, crisp detail, with no monograms, removals, repairs or alterations, make this an especially attractive offering. The soft, warm, original antique finish is present, with no buffing or machine polishing. 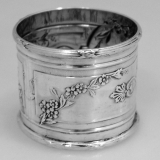 American sterling silver napkin ring made by Albert J Gannon, 1910. This large napkin ring has an applied swirling Gadroon rims and is monogrammed EME. Dimensions: 2 3/16" - 2" and weighs a very substantial 68 grams or 2.2 ozs Troy. The excellent original condition and clear, crisp detail, with no removals, repairs or alterations, make this an especially attractive offering. Monogrammed as described above, the soft, warm, original finish is present, with no buffing or machine polishing. American sterling silver mechanical olive spear with the repousse scroll decorated handle. Dimensions: weight 0.8 oz. Troy; length 11â€. 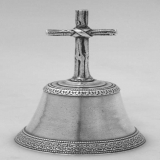 American sterling silver Aesthetic style table bell, c.1890, with applied leaf bands on the top and bottom of the heavy, cast body, having a cast tree branch from cross as a handle. This wonderful bell has the rich tones that you would expect from such an elegant work of art. Sterling silver Arts & Crafts napkin ring in the Carmel pattern by Wallace Silversmiths, c. 1915. This most atractive, rectangular napkin ring has applied, hand hammered, strap work borders and is in excellent original condition, having great detail on the strapwork and rivets. 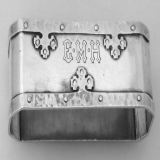 Monogramed "EMH" Dimensions: Weight: 0.9 ozs Troy Length 2 1/2" Width: 13/16" Height: 1"
Sterling silver Arts & Crafts napkin ring in the Carmel pattern by Wallace Silversmiths, c. 1915. This most atractive, rectangular napkin ring has applied, hand hammered, strap work borders and is in excellent original condition, having great detail on the strapwork and rivets. 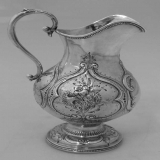 Monogramed "REH" Dimensions: Weight: 0.9 ozs Troy Length 2 1/2" Width: 13/16" Height: 1"
American coin silver large cream pitcher made by William Dean Whiting of Attleboro Massachusetts, c.1854. This lovely pitcher has 4 scroll bordered panels of floral repousse decoration o nthe body, a beaded rim under the spout and a nice "C" scroll handle . It sits on a circular pedestal base that has scroll & foliate decorations and a beaded border. Monogrammed, in the centreal panel, in ornate, period script, "CBG"., the pitcher is in excellent original condition, with no repairs, removals or alterations. Dimensions: Height: 6 1/2" Width Handle to Spout: 4 3/4" Weight 5.5 ozs Troy Maker & Marks: William Dean Whiting, Attleboro Massachusetts 1853-1855 W. D. Whiting & Co; Pure Silver Coin CLICK HERE fro more about William Dean Whiting . American sterling silver, floral, repousse tea caddy in a paneled quatrefoil form made by Black Starr & Frost of New York City, c.1885. The body and lid are decorated with floral, foliate and scrollwork designs and the lid has a removable pineapple two piece finial. The front panel of the body is monogrammed within an ornate scrollwork cartouche, in ornate, period script "MCK". Mexican sterling silver Martini pitcher made by William Spratling ot Taxco Mexico. American coin silver large Federal coffee pot made by Wood & Hughes for Squire Bros. of New York City, c.1845. This elegant early Wood & Hughes coffee pot has classic styling and excellent weight. The stagâ€™s head over a shield crest engraved on the bellied body adds to its appeal. The pot, including the original ebonized handle, is in excellent original condition, with no repairs, removals or alterations. Dimensions: Height: 12" Width Spout to Handle: 9 1/4" Weight: 32.7 ozs Troy Marks & Maker: Wood & Hughes New York City maker Squire & Brothers New York City retailer Squire & Bros; W&H. American Federal coin silver porringer made by Obadiah Rich of Boston Massachusetts, c.1830 â€“ 1840. 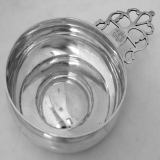 This attractive porringer has a cast, keyhole handle monogrammed "EMB" and the body is inscribed " Sarah McGregor". American coin silver irregular octagonal footed salver made by Gale & Hayden of New York City and retailed By Gregg & Hayden of Charleston South Carolina, in 1847. This handsome salver is covered with flat chased engraving depicting myriad period scenes, including: a fisherman on a bridge near a large Pagoda; a hunter and his dog; a dogâ€™s head, a church with a large steeple; peacocks; trees; a sailboat on a lake with a castle on the shore; a deer; all surrounded by floral, foliate, scroll, shell & geometric decorations. The salver sits on four, cast, shell and scroll feet. And has a wide, applied dart border. This tray also bears the crest of the Ten Broeck family. The first Ten Broeck settler in America, Wessel Ten Broeck, came to the Colony of New Netherland with Peter Minuit in 1626. The Motto on the Crest reads: "Perge Coepisti" "Go on as you have begun". Dimensions: Weight: 24.7 ozs Troy Length: 12 1/8â€ Width: 9 5/8â€ Height: 1â€ Maker & Marks: Gale & Hayden New York City 1847 Gregg & Hayden Charleston South Carolina (retailer) G&H in oval; O; 1847 in a diamond; G&H in a rectangle. CLICK HERE to see a Ten Broeck Crest. American coin silver irregular octagonal footed salver made by Gale & Hayden of New York City and retailed By Gregg & Hayden of Charleston South Carolina, in 1847. This handsome salver is covered with flat chased engraving depicting myriad period scenes, including: a fisherman on a bridge near a large Pagoda; a hunter and his dog; a dogâ€™s head, a church with a large steeple; peacocks; trees; a sailboat on a lake with a castle on the shore; a deer; all surrounded by floral, foliate, scroll, shell & geometric decorations. 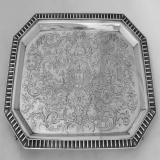 The salver sits on four, cast, shell and scroll feet. And has a wide, applied dart border. This tray also bears the crest of the Ten Broeck family. The first Ten Broeck settler in America, Wessel Ten Broeck, came to the Colony of New Netherland with Peter Minuit in 1626. The Motto on the Crest reads: " Perge Coepisti" "Go on as you have begun". Dimensions: Weight: 24.7 ozs Troy Length: 12 1/8â€ Width: 9 5/8â€ Height: 1â€ Maker & Marks: Gale & Hayden New York City 1847 Gregg & Hayden Charleston South Carolina (retailer) G&H in oval; O; 1847 in a diamond; G&H in a rectangle. CLICK HERE to see a Ten Broeck Crest. English sterling silver Four Graces ink well made by Wakely & Wheeler, London 1911. 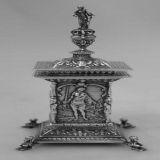 This exceptional, classical revival style inkwell has a detailed, ornate body decorated with nicely detailed full figure portraits of the Four Graces, one on each of the four panels. Each panel is bordered by figural columns and the body sits on an angled, mask, floral, and foliate decorated base supported by four, cast sphinx splayed feet. The ornate lid has a finial in the form of a wizard holding a mask shield with a snake coiled around one of his arms. The robed figure sits atop a scroll footed pedestal resting on a mask decorated urn. The top of the lid is decorated with masks, floral and foliate decorations and has an engraved, scrollwork border. As this inkwell has such a diversity of detail, some may have been overlooked in the description. It seems to be never ending â˜º The original glass insert is in perfect condition. The overall condition of the inkwell is excellent, with no monograms, removals, repairs or alterations. 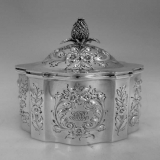 Dimensions: Weight: 7.5 ozs Troy Height: 5 Â½ " Diagonal: 3 Â½ " Maker & Marks: Wakley & Wheeler, London, with a full set of hallmarks, on both the body and lid, for 1911 WW under & in a trefoil, 23Q; Lion Passant; Leopardâ€™s Head; q.
English sterling silver coffee pot made by Francis Crump in 1761. This elegant, Georgian coffee pot has an elongated, bellied body with a fancy, scroll decorated spout and handle sockets and an original ebonized wooden handle. 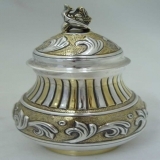 This heavy, well made pot sits on a circular, stepped base and the hinged lid has a swirling flame silver finial. There are no monograms or removals and the condition is excellent, with no repairs, removals or alterations. Dimensions: Height 9 Â½" Length Spout to Handle 7 Â½" Weight 19 ozs Troy Maker & Marks: Francis Crump London England with a full set of Hallmarks for 1761 Lion Passant; Leopardâ€™s Head Crowned; f ; F C in a rectangle. 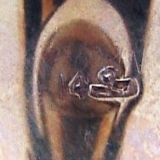 Marked on the body, just under the rim near the handle, as pictured. American coin silver footed wine goblet with repousse floral and scroll designs inscribed "Horace Mann" , who was an American educator generally credited with founding the institution of public education in the United States. Dimensions: Weight 2.5 ozs. Troy Height 5" Diameter 3" Maker: George Linder, Philadelphia, 1836-1850. American sterling silver hand hammered small round bowl, no monograms or removals, excellent condition. Dimensions: weight 7.3 ozs. Troy; diameter 5 Â¾â€; height 2 Â¼â€ Maker: marked F. J. R. G, for Frederick J. R. Gyllenberg, Boston Mass. c. 1900-1925. Gyllenberg made silver and copper holloware at the Handicraft shop with Karl Leinonen. The Handicraft Shop was one of Bostonâ€²s leading Arts & Crafts centers which employed such notable metalsmiths as Frederick Gyllenberg, Seth Ek, George Gebelein, C. G. Forssen, Karl Leinonen, Rebecca Cauman, Mary Winlock, Sybil Foster, Alfred Swanson, and Mary Catherine Knight, who was initially hired by the Shopâ€²s founder to supervise the operation. The Shop, founded by the Society of Arts and Crafts, opened in 1901 to produce objects made of wood, leather, and metal. By 1906 the Shop was working exclusively in metal. American sterling silver, hand made, hand hammered Arts and Crafts serving bowl made by Falick Novick of Chicago, Illinois, c.1930 having a double fluted design which divides the bowl into four panels, one of which has an applied Arts and Crafts style monogram â€œTâ€. Novick is an extremely desirable Chicago Silversmith whose work seldom comes on the market. The best book on Chicago silver is Sharon S. Darlingâ€²s Chicago Silversmiths, published in 1977 as a catalog of an exhibition by the Chicago Historical Society. Darling mentions dozens of silversmiths who worked in Chicago, but several stand out. One is Falick Novick, who came to America from Russia in 1893 at the age of 15, and was initially employed as a plumberâ€²s assistant. In 1907, he moved to Chicago to work as a silversmith, but struggled for years. Novick produced copper bowls for the Kalo Shop until 1920, when it stopped selling copper items, and the heavy silver trays for which he is best known. He eventually prospered and sold his work through retail outlets such as Macyâ€²s until he died in 1957. Novickâ€²s mark was usually STERLING / HANDWROUGHT / BY / F. NOVICK / CHICAGO, although the city was sometimes omitted. His work, and that of Heinrich Eicher, are on a par with Kaloâ€™s. American sterling silver Arts & Crafts hand hammered hand made creamer, sugar bowl and matching sugar spoon, all having an applied â€œTâ€ monogram. The set is in excellent original condition, with a wonderful finish and no repairs or alterations. Novick is an extremely desirable Chicago Silversmith whose work seldom comes on the market. The best book on Chicago silver is Sharon S. Darlingâ€²s Chicago Silversmiths, published in 1977 as a catalog of an exhibition by the Chicago Historical Society. Darling mentions dozens of silversmiths who worked in Chicago, but several stand out. One is Falick Novick, who came to America from Russia in 1893 at the age of 15, and was initially employed as a plumberâ€²s assistant. In 1907, he moved to Chicago to work as a silversmith, but struggled for years. Novick produced copper bowls for the Kalo Shop until 1920, when it stopped selling copper items, and the heavy silver trays for which he is best known. He eventually prospered and sold his work through retail outlets such as Macyâ€²s until he died in 1957. Novickâ€²s mark was usually STERLING / HANDWROUGHT / BY / F. NOVICK / CHICAGO, although the city was sometimes omitted. His work, and that of Heinrich Eicher, are on a par with Kaloâ€™s. Dimensions: Creamer: weight 7.6 ozs. 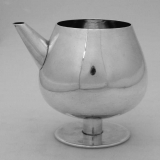 Troy, height 3 Â¾â€, length 5 Â¾â€ Sugar bowl: weight 7.6 ozs. Troy, height 3 Â¾â€, length across the handles 6 Â¼â€ Sugar spoon: weight 1.2 ozs. Troy, length 6â€ Maker: Falick Novick Chicago Illinois. Marked: Sterling Handwrought by F. Novick Chicago. C.1925-1935. American sterling silver floral repousse gravy boat and matching under plate or tray in the Baltimore Rose pattern by Schofield Silversmiths of Baltimore, Maryland, c.1905. This wonderful set has a oval, spread foot repousse base and matching handle and is in excellent original condition, with no repairs or alterations. Monogrammed, on the outside of the spout and the center of the under plate EHB in ornate, period script, this very scarce and desirable serving set will be a joy to own and use. Dimensions: Gravy boat: Weight 8.6 ozs Troy,; Height 5 Â½â€, Length 8â€ Under plate: Weight 5 ozs Troy; Length 8â€; Width 5â€ Maker: Schofield Silver Company Baltimore, Maryland, c.1905 Marks: STERLING 925/100 FINE; H in a diamond; Lion in a circle; S in a diamond. Good, clear marks.